There are more and more people who are doing data entry jobs from home. A lot of them have also reported having problems with sneaky clients. While it may be difficult to detect if the job is legit or not, it can help if data encoders know how to distinguish one from the other. Read on to get some guidance on spotting a legitimate one. Most data entry jobsare paid based on the output that a data encoder can finish in a certain amount of time. Keep in mind that to make the client happy, the data encoded must be free from errors. Data entry jobs from home that do not come with complete or detailed instructions from a client must be avoided. Clients who scam data encoders actually use this scheme as an excuse not to pay the encoder for the job done. To avoid this, it would be sensible to clarify instructions before starting any work. If the client is still unable to give out a detailed instruction after clarifications, then it is time to dumped that client. One thing that always traps people into problems with transcription jobs like medical data entry jobs home or typing jobs from home is the publicity that most job opening get. They usually offer a higher pay than usual, but there is a catch to it. The offer is good only for a certain period of time and if one decides on grabbing it, the output should be delivered in an amount of time that is most likely impossible to achieve. Always remember that data entry jobs from home deal with very sensitive data, and most clients would rather want their encoders to work on it slowly but surely. 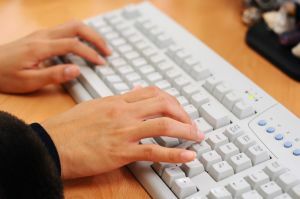 Since data entry is done with the use of a computer, and data entry work from home jobs are usually found online, it is easier to check if the job offers are legit or not. There are various ways to check and verify the a company offering data entry jobs from home. Online reviews help people voice out their satisfaction or dismay over a certain product or organization. Finding positive and negative comments may sometimes confuse those who are looking for data entry jobs from home that will assure them of a pay. However, because these reviews are done online, one cannot actually find proof if the positive and negative comments written about a certain client may be written by the client itself (positive comments) or a competitor of the client (negative comments). When this happens, it is best to use good judgment. There are also websites that handles rip-off reports and it may be worthwhile to check if there have been rip-off reports about the client offering data entry jobs from home. Workers do not usually like it when clients rip them off and they usually post their bad experiences as a way of getting back to the client who ripped them off or just to warn others who may be looking for a data entry job. Allocating a certain amount of time to avoid scams and get a real data entry from home jobs can be the best move to make to avoid being ripped off. After all, it is not joke to dedicate a lot of time doing the data entry and end up not getting paid. Work From Home Envelopes – Are They For Real?